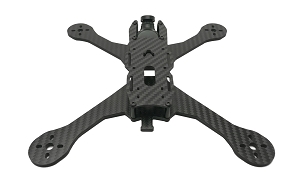 Arm size 4" 5" 6"
A top-mount stretched X for both racing and freestyle. The RS (Race/Style) has been designed to bridge the separation between dedicated freestyle and racing frames. 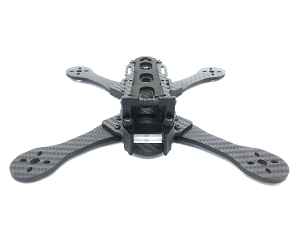 Its light weight and lean format makes it a perfect for the track. 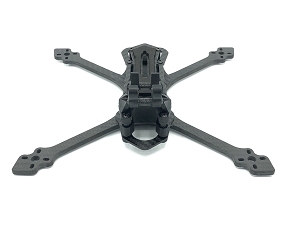 With titanium hardware it weighs less than some of the most popular pod style underslung frames. 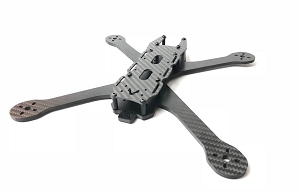 The included GoPro couch then makes it an extremely competitive freestyle performer and the first top mount, stretched-x Hyperlow in that category. 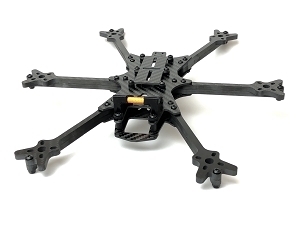 The RS arms (stretched X 4", 5" and 6") are compatible with the extended RS+ body. Likewise the RS+ arms (squashed X and True X) are compatible with the shorter RS body. 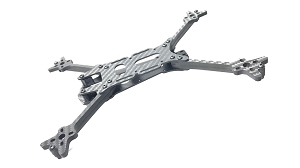 The underside brace plates have slightly different geometries to match the arms also - so please pay attention when matching arm type with brace type for an exact match. Example FC mounting. 20mm bolts for a 30x30 stack. 12mm can be used with the nylon standoffs.